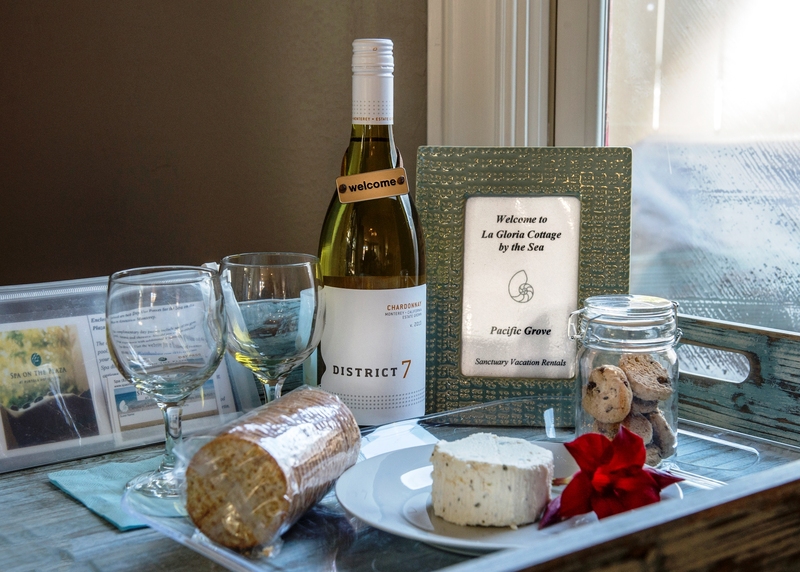 Welcome to La Gloria Cottage-by-the-Sea! Home sleeps 6. 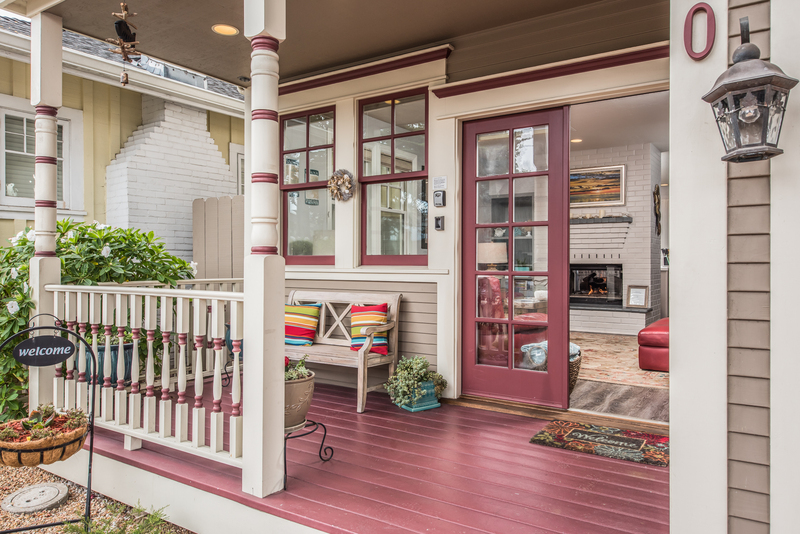 Restaurants, shops and art galleries are just steps away from this historic house in the heart of Pacific Grove, a lovely two-story residence that offers easy access to all the best that “America’s Last Hometown” has to offer. The 1,500 square feet pet-friendly home, a winner of the Pacific Grove Heritage Design Award, has been extensively remodeled so that while it retains its gracious past, it also offers modern conveniences at its spectacular location. Just a 3 minute walk to award-winning Passion Fish Restaurant and a 10 minute walk to the beach or to the butterfly groves, it’s also only 5 minutes by car to the Monterey Bay Aquarium and Cannery Row, 10 minutes to shopping in Carmel-by-the-Sea, and 15 minutes to golf and fine dining in Pebble Beach. A brick pathway leads visitors underneath a magnificent Monterey pine and up to the front porch which offers seating on a beautiful Butler plantation bench. The entry way opens into the cozy living room, a perfect place for conversation or watching TV on a 50-inch HDTV. 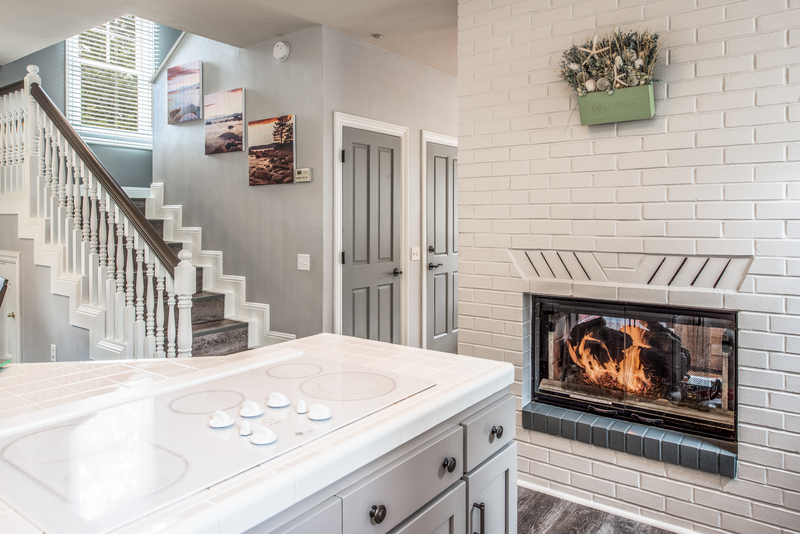 Casual with an upscale elegance and earth-tone colors, the décor is embellished with coastal touches, and the feeling is enhanced by comfortable red leather couches surrounding a gas fireplace, which has an additional hearth on the other side facing the kitchen. Hardwood floors can be found throughout the ground floor, which includes the living room, kitchen, and dining room. 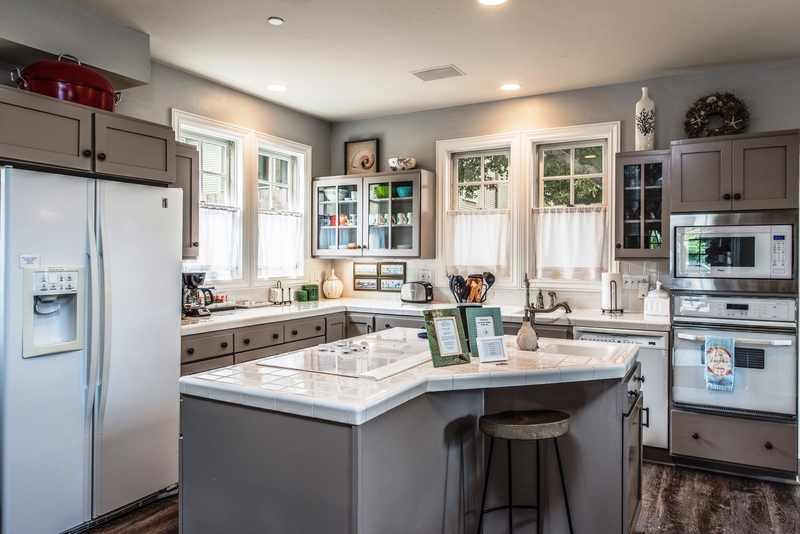 The large kitchen includes newer appliances, a double kitchen sink with a pewter goose neck faucet, and a combination microwave/convection oven. A central island offers an additional small sink and counter seating for two. 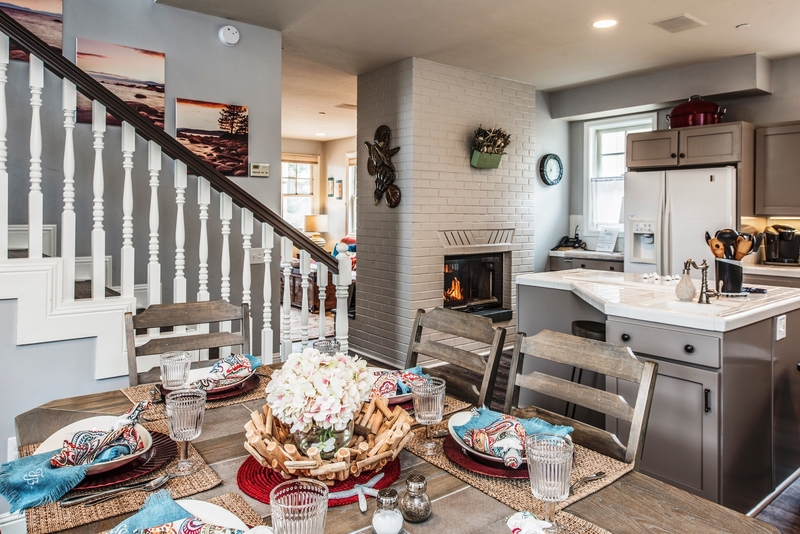 White tile counter tops and whitewashed cabinetry add a contemporary rustic touch, and the adjacent dining room offers seating for eight at a beautiful Geranium leg table with optional extension leaf. A private patio enclosed with a wood fence is accessible via French doors from the kitchen. Potted succulents grace the outdoor space, which offers seating as well as a gourmet gas grill. The second floor of the home includes a master bedroom suite and two additional bedrooms. Vaulted ceilings lend the rooms a spacious feeling and plenty of natural light enters through the many windows and skylights on this floor. 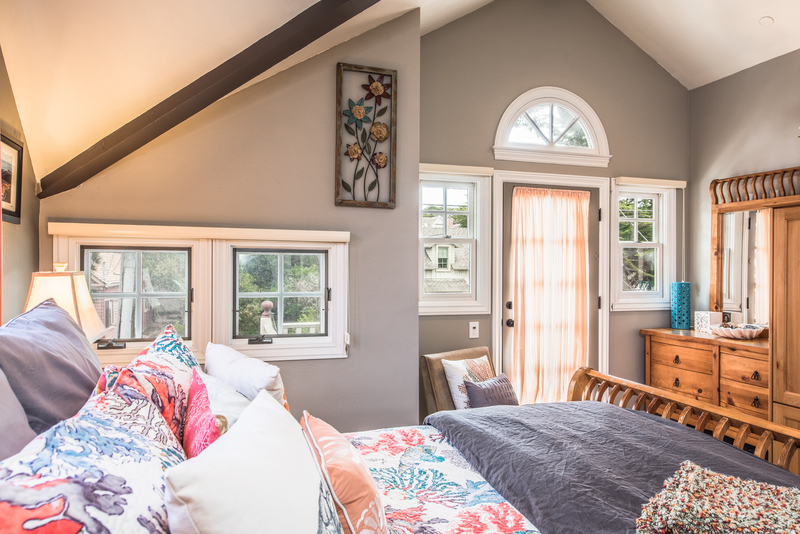 The master bedroom includes a queen size knotty pine sleigh bed, a 36-inch HDTV, a large closet with mirrored doors, and an outdoor balcony with bistro seating that overlooks downtown Pacific Grove, a perfect place to relax and enjoy a glass of wine in the evening. The adjoining bath, outfitted with limestone tile and brushed nickel fixtures, includes a tub with hand held sprayer, a separate shower stall with a height-adjustable shower head, and a private commode. The second bedroom has a queen bed, and the third bedroom has a two twin beds that can be converted to a king as needed. 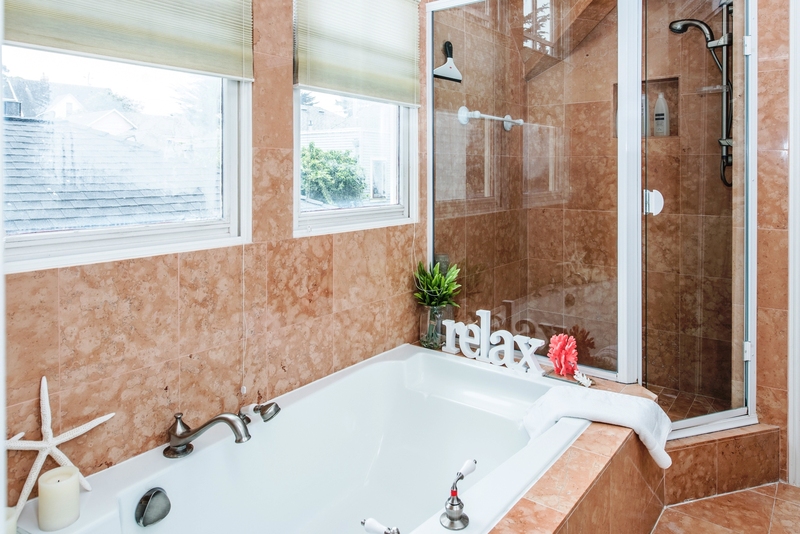 The second bath in the hallway has a combination tub/shower with height-adjustable shower head, as well as marble tile throughout and brushed nickel fixtures. Washer/Dryer are located on the second floor near the bedrooms; a central vacuum system is available as well. Garage doesn't accommodate a car, but has everything for a day at the beach and has room for bikes and storage. See Rates Notes for additional information about this property. "Practically Perfect in Every way! This has to be one of the best-appointed places I've ever stayed. Literally, the only kitchen apparatus they didn't have were a waffle maker and fondue pots(both Christmas traditions so we brought our own.) But literally everything else they HAD. Pots, pans, cookie sheets, spatulas, whisk, at least 8 mixing bowls, electric mixer. Beautiful place settings, extra chairs, extra blankets. Kids toys, kids silverwear, did I mention a FULL size grill outside? THEY DECORATED for CHRISTMAS!!!! We walked into a beautiful table setting that could have graced Pinterest or Good Housekeeping. Everything was lovely. Now we had a lot of guest for Christmas Eve and morning around 12 so things got a little tight downstairs. This being said if you only had six people it was perfection. 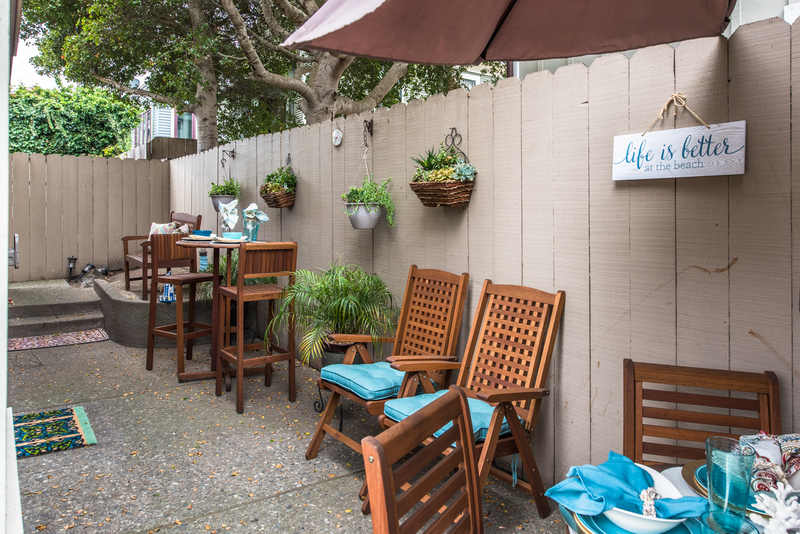 It is in a perfect location in downtown Pacific Grove. Now there are one or two things I'd change only as a parent and I would give this place 6 stars if I could so these are two very tiny notes. My child of 18months is a kamikaze when it comes to electric outlets. If there is an outlet within a 100ft my kid is trying to stick something in it. If your child is similar bring some electrical covers. And I wish they had some kind of hook on the coffee table that slides for pillow storage as we ended up with several pinched fingers. This is one of the nicest cleanest beautiful places I've ever been in. It was perfection! We can't thank the hosts enough." "This home is AMAZING!! Such a beautiful home to relax in. It has all the amenities you could want or expect in a home. Our stay was very comfortable for a family of 4 adults-plenty of room for everyone. This home is so close to all the restaurants and stores on Lighthouse Avenue. 5 minute drive to Cannery Row and Monterey Bay Aquarium, less than 5 minutes to Lovers Point and 5 minutes the other way to the ocean. It was such a relaxing vacation for our family in Pacific Grove at La Gloria Cottage by the Sea." "Beautiful home convenient to lovely town and coast! Lovely, spacious, perfect location. We enjoyed the pretty home and our vacation. Very clean and comfortable." "WOW! This house and town were great!! The house had everything that we needed. It was clean and very organized. We walked to restaurants and the beach everything was close by. I wish that we could have stayed longer but we will definitely be back." "Exceeded expectations! Excellent in every sense of the word. Great location just off Lighthouse with easy access to cafes, restaurants and shops. Short 5 minute walk to Lovers Point and Monterey Bay. Well kept home with every amenity imaginable. The owners have thought of everything to make you welcome and comfortable. Clean, bright, and authentic. We will return!" "Wonderful location, well appointed, very comfortable. Everything you could ask for in your home away from home. Every detail is thoughtfully considered. The kitchen has everything you need for cooking any meal - even Thanksgiving dinner. Plenty of seating for two couples and a 3 year old. Great location for a beach get away. I would definitely stay here again"
"Great place, great location! Place was great with an amazing location close to the local Pacific Grove shops and restaurants. The rooms are quite compact but more than adequate for a vacation property. Managers were very helpful and the condition of the house was perfect. There was a small issue with one of the wardrobe doors when we arrived but the maintenance team sort to fix very promptly. Would recommend this property for anyone looking to rent in the Pacific Grove / Monterey area." "Great family getaway! This was one of the best homes we have ever stayed in. Location was perfect. Home was just the right size, not to big but perfect for a family vacation. Kitchen was more than adequate, beds were comfortable and living room was very comfortable. Location across the street from the best coffee shop in town was an added benefit." "Very well decorated home close to eveything you would want to do in the Monetrey area. This a great home for a family or a few couples - close to great dinning (walking distance) and just a short drive to Carmel, Monterey and the outstanding 17 Mile Drive tough Pebble Beach. They are open to pets and our dog enjoyed her stay as well - especially the ball playing on Carmel Beach. Very clean and everything you would want to prepare a special meal in the kitchen. The bedrooms are decorated out of a designer magazine - lovely. Again - the stay, the home and location were the best!" PS...."My only issue is having to pay a cleaning fee for each night you stay seems unreasonable. I rent a home on VRBO and we charge one fee for cleaning if it is 3 nights or two weeks." SVR Response: "The cleaning fee is a one time charge regardless of the length of stay. It may have seemed like a nightly charge given your stay was for three nights and number was easily divided by three. We apologize for the confusion." "Great place in a great location! Although the weather was really bad during our visit, the house was awesome! It was well decorated and well equipped. The furniture was very comfortable. The televisions, entertainment system and internet were great. The yard is very small, but serviceable. The location is terrific. We couldn't have asked for a better rental." "Charming, clean, cute and comfy home in Pacific Grove! We were thrilled with our choice to rent this home in Pacific Grove. Other than the construction occurring on the street by the driveway which made it challenging when first arriving, everything was spectacular! The home was absolutely perfect for what we were looking for. The entire renting experience was super easy and we had no issues at all with the home. There was such a nice greeting card welcoming us to the home along with wine and cheese. The house was very clean and decorated just beautifully. It was so nice that everything was labeled with instructions making it easy for us to use the electronics and fireplace. We were in town for the Big Sur Half Marathon and this home was a perfect location. The race actually ran right by the main street where the house is located off of- which made it perfect for those non-runners in our group that wanted to spectate. The town had such great coffee shops and restaurants and it was so nice just to be able to walk to breakfast, dinner, etc. I would definitely recommend this home and would stay here again. Thanks for making us feel so welcome in your home!" Amazing Stay! My family travels to Pacific Grove once a year for a mini vacation/birthday celebration. We also like to attend the annual Halloween party at the Monterey Bay Aquarium. This house was by far the nicest rental we have ever rented in PG! The location, size and layout was perfect. The house is decorated with tranquility in mind. The day we arrived the street was closed due to road construction, but we were allowed to slip by the road blocks and park in the driveway. Once parked, you will not need your car again ... everything is within walking distance. We will be back!!! "Outstanding! Outstanding property and great customer service from Sanctuary. Second rental from them and will rent again. No negatIves. If you want to visit PG, Monterey or Carmel - a no brainer." "Quaint award-winning home in PG. Working with Sanctuary Vacation Rentals was extremely easy and the property we stayed at was very clean and fully stocked for all of our needs. The kitchen had all appliances and utensils imaginable, and the bathrooms had shampoo and body wash. Additionally, there was detergent and dryer sheets, which made washing clothes very convenient! The company provided many helpful notes throughout the renting process. My favorites were 1) a reminder email when the 2nd half of the payment was going to be auto drafted from my account. This was helpful because it was over a month since the booking, and I could have easily forgotten the auto-draft was about to occur. 2) Julia was extremely responsive and easy to work with. For example, we ended up arriving later than expected on our first day, and she made sure the porch lights were on for us. Overall great experience!" "Great Family Get Away! I rented this house for my parents, my sister and her husband, and my younger sister and her boyfriend for my wedding week so 6 adults total. We booked for 5 nights and had an incredible time. My husband and I stayed at another of Sanctuary's rental properties with his family just one street over so both families were able to walk back and forth to say hello and hang out. Although I didn't stay the night at La Gloria I was over there frequently and my family said they absolutely loved it. They especially loved the kitchen and the coziness of the home. The double-sided fireplace was a nice touch and was definitely put to use as it was pretty chilly during our visit. The house was very clean and organized and the location was perfect. You are within walking distance to many restaurants and coffee shops as well as the beach path. The non-master rooms were a little on the small side especially if you have large suit cases but it wasn't that big of a deal. You also can't park in the garage but street parking is plentiful. The Sanctuary staff was really easy to work with and very friendly. They are very prompt to reply to emails or phone calls. My sister ended up leaving a couple items behind and they were very helpful in getting them returned to her quickly. I would definitely recommend La Gloria Cottage if you're planning a trip to the area. Can't wait to go back!" "Living the Dream!! We have been coming to Pacific Grove for the last 20 years, but this was our first time renting a home here. What an experience! Knowing the area well, and having looked at potential 2nd homes, we knew exactly where this home was. La Gloria is located right off of the main road, Lighthouse, and is a gem! The owners have spared no expense. It is completely renovated with modern touches, but still have that "PG" cozy, warm feeling. The rooms are spacious, beds are comfy, kitchen has everything, plus little details such as day passes to Monterey Plaza Hotel Spa facilities, a bottle of wine, etc. we truly felt like we were locals here staying in this home." "Great Vacation Home! This home is perfect. Perfect location in Pacific Grove. Well appointed and very clean. I never want to stay in a hotel again. Julia Mendenez, our house manager was so helpful and went above and beyond to make our visit comfortable." "Absolutely beautiful!!! My husband and I stayed at La Gloria Cottage by the Sea in June and love every moment of it!! The home is absolutely beautiful and incredibly peaceful. We were so thankful we stayed here. We were able to get some much needed rest and truly get refreshed. The home is close to coffee shops, restaurants, cute shops and even a bakery!! Lovers point and the ocean are very close as well. We cannot wait to come back to La Gloria with our family. If you're looking to stay in Pacific Grove you won't want to miss your opportunity to stay in this home. Seriously one of the most peaceful and relaxing vacations we've had! Cannot wait to make even more memories at this vacation rental." "Fabulous Beach House! We loved staying in this perfectly decorated and maintained beach cottage. There were 6 of us and a baby and there was plenty of room for everyone. We had absolutely everything we needed and then some. It felt like a home away from home and we look forward to returning. 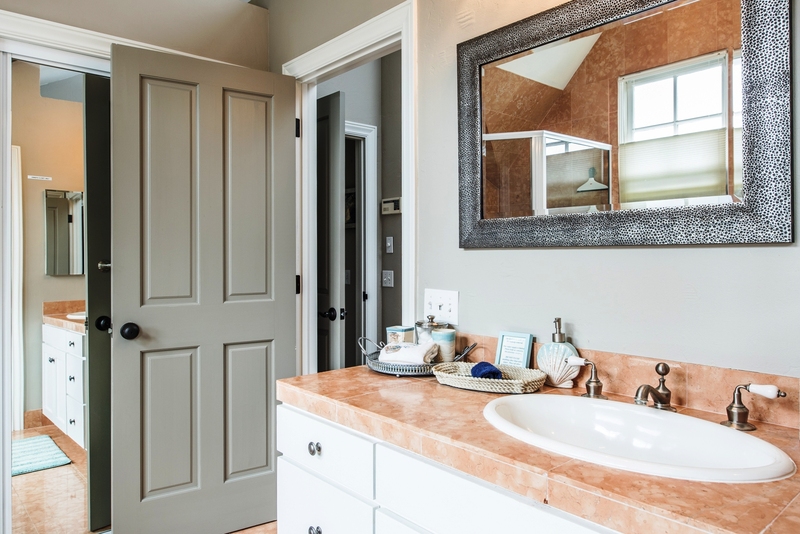 Upon entering you feel like you are in a model home with every detail tended to. Everything is in close and much is within walking distance. You can enjoy the shops, restaurants and all that Pacific Grove has to offer right outside your door. The beach and Lover's Point are also just a few blocks away and easy to walk to. All of the rooms were inviting and comfortable. We didn't have room to pack a highchair and one was brought to us within an hour. We were so impressed with the beauty of the home, the service that was provided and our overall experience. There were beach towels, toys and chairs in the garage along with everything you could possible want or need in the kitchen. Highly recommend if you are staying in the area." "The Most Amazing Beach House! Words cannot express how happy my family and I were with this home! We truly felt like it was something of our own and not a rental. We will most definitely stay here again in the not so distant future!" "GORGEOUS BEACH HOUSE!!! My family and I stayed here in May. I checked out many hotels and beach houses before this one, and nothing came close or even compared to how beautiful this house was! This house is furnished with everything you would possibly need to make your stay comfortable for adults and kids. It is in the heart of the town and walking distance to almost everything. It is also in between Monterey and Carmel which makes this place that more fabulous! Best vacation we've ever had! This will definitely be our new annual vacation destination!" "A Real Gem! Loved this adorable cottage at first sight. Great location next to Passion Fish, Red House Cafe, Holly's and a .2 mile walk or less to Jenini's, Favaloro's, & Fandango. The interior is solid and well-appointed. Kitchen and dining area are spacious and the view coming down the short steps from upstairs is inviting. We stayed in the master bedroom with en suite bathroom. Were very impressed with the fit and finishes all around. These are owners who pay attention to the smallest details. They didn't have to do Hunter-Douglas coverings everywhere but they did. Just felt comfortable in every part of the house. Which is not always been our experience in PG. Sometimes the rentals can be too precious or doll-like if you know what I mean... We didn't use the small backyard or the barbecue. That might be the only downside to this property, assuming you wanted to entertain outside. That said, my favorite part of the house was the front balcony with table and two comfortable chairs for reading and yes, that required glass of wine. We have rented five houses in PG and this would be high on the list to return to." "WOW! This home not only met but exceeded all our expectations! What a lovely, comfy home-away! There wasn't a stone unturned as it came complete with every single thing you can imagine you need. It was tastefully designed, fully stocked, and just PERFECT! Thank You for ten lifetimes of memories made here! We WILL return!" "Wonderful Getaway! My family of 5 stayed at the La Gloria Cottage right before Christmas. The house was beautiful and cozy, and had everything we could have possibly needed! We loved relaxing by the fireplace and cooking in the beautiful kitchen. The home is also in a great location, within easy walking distance to everything! We would stay here again in a heartbeat." "What an absolutely lovely home. We loved everything about it. It has such unique architecture and is decorated beautifully with pretty linens, towels and bedding. It was definitely too short a visit and would like to come back again soon. Thank you for sharing your home with us." Maximum occupancy - Home sleeps 6 adults and 1 child age 12 or under. Note: Master bedroom has a 36” HDTV, access to a balcony and an en suite bathroom with tub and separate shower. Note: Hall bathroom on this level has a shower-over-tub.